Why is our work exceptional? Typically, you will encounter either a group dedicated to science and education, or a group dedicated to producing fossil replicas and displays, but rarely both combined. Our team presents a rather special opportunity in that in addition to offering fossil replicas, molding and casting services, and fossil preparation services, we are chiefly composed of active scientists and educators. With us, you are working with a group that has extensive experience and knowledge of the science behind the fossils. We are the ones who go into the field, make the discoveries, and excavate the actual fossils. We are the ones who publish the our findings in scientific journals. And we are the ones, with experience in mounting both originals and replicas; a task that requires an understanding what these animals would have looked like and what would have been a natural pose. This also requires high degree of talent in fossil restoration, casting, sculpting, and painting in order to produce original mounts and replicas that are both a scientifically accurate and works of art. 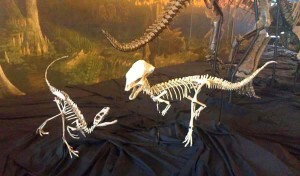 Fossil replicas offer many various advantages. Original fossils can be costly to transport, and each time one is moved there is a risk of damage. Replicas are much more durable, and can be replaced if one is damaged or destroyed. The durability is also helpful when studying specimens, or teaching school groups. Researchers or students will have a chance to handle specimens that would otherwise be unavailable, either because of geographic location or the fragile nature of the fossil. 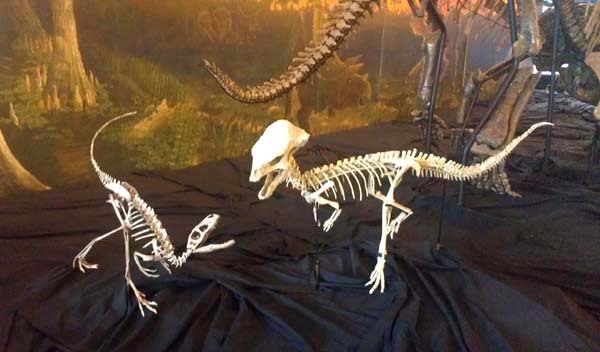 When molds are made of a fossil specimen, you can also produce multiple “clones” of a particular piece for a display, such as replicating a skeleton several times to make a herd of flock of animals. This enables us to create displays with dynamic animal interactions, and to experiment with poses not possible with fragile original bones. Also, for those unable to spend a small fortune on an original skeleton, replicas offer a much more budget-friendly way of getting an impressive mount.